Attention Students: I am now available to teach worldwide. There have been some changes in my life that have resulted in my being more available to take on new students of guitar, bass, and beginning 5-string banjo. 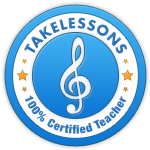 Locally, I’m filling up after-school hours pretty quickly; but I can offer lessons online via Skype or Google Hangouts to English speakers in any time zone. If you have enjoyed the content in this site, and you are looking to take your skills to a new level, or even if you or someone you know is a total novice, we may work well together. For more details, check my TakeLessons.com profile here. You can also post questions in this article’s comments. Thank you once again, all who visit and subscribe to the site! You can also look forward to more regular updates now that my mornings have opened up. Stay tuned. © 2019 steelstringcheese. All rights reserved.